5 years after Yolanda: How do you weather-proof the Philippines? TACLOBAN CITY, Philippines -- The country should be using dynamic maps capable of hazard-specific, area-focused, and time-bound warnings to help shield itself from storm surges and massive devastation from violent typhoons like Yolanda (international name Haiyan) that brought this city to its knees five years ago. The warning was made by Dr. Mahar Lagmay, a geologist specializing in such maps, before the arrival of typhoon Rosita (Yutu) during an interview in Manila. Typhoon Rosita was expected to make landfall Tuesday in the Isabela-Aurora areas, about 250 kilometers north of the capital. Its strength has been compared with those of Ompong (Mangkhut) and Lawin (Haima), which barreled their way through the same provinces just last month and in October 2016 respectively. Ompong left at least 80 dead and more than a hundred hurt. Rain-induced landslides it brought buried workers in a mining village in Itogon, Benguet. Lawin has been likened to Yolanda, and it left at least four dead, burying them in landslides (some accounts say a total of 12 died). Ompong's and Lawin's strength are levels below Yolanda’s, but came years after it, which should have taught typhoon-prone countries like the Philippines lessons on preparation and disaster mitigation. Lagmay is citing the use of probabilistic maps, which are so specific they are able to say what kind of hazards particular communities are facing, and when. Theoretically, this would allow people to prepare and move in safe directions at the right time. "If you go beyond what the community has experienced, if you go beyond interviews in generating the storm surge hazard maps by using science and technology, by simulating the possible scenarios, including those scenarios bigger than what the community has experienced, including scenarios that incorporate climate change and sea level rise, you may be able to do that," Lagmay said about the possibility of preventing deaths and destruction from violent typhoons. "It's called probabilistic mapping; you create multiple scenarios using your computer and input parameters coming from the historical record and you project those models, models that would depict storm surge inundation, with many scenarios, some of them bigger than what the community has experienced," Lagmay said. Lagmay noted that community experience, the retelling and documentation of what the people have witnessed, is important. But given worsening climate change effects, typhoon-prone areas should be able to supplement what was experienced and were known with possibilities of what might be. In short: weather-proofing communities against future devastations. The Philippines gets about 20 typhoons yearly. Most of these are destructive, if not fatal. Yolanda, which has been described as the world's strongest typhoon in recent years, packed winds in excess of 300 kilometers per hour, just before it made landfall here, in the Visayas. Climate change watchers have been warning about typhoons getting more violent, and communities hit claiming they have never seen or felt something stronger has been a refrain when survivors are interviewed. This is why there is need to prepare for something we have never seen before, Lagmay said. "That way, you are anticipating the bigger events, you are doing anticipatory planning if you use these hazard maps in citing evacuation centers and developing the community, and getting the people to know what to expect, hazard events such as storm surge events like Yolanda, bigger than what they have experienced,” he said. Lagmay's point: If that is the case, "it is imperative that we be able to visualize through science and technology scenarios that are bigger than what we have experienced. We need to simulate those, and by doing so, with science and technology, visualize the bigger hazards in the future, so that we can do anticipatory planning of our communities. That is called as probabilistic risk assessment." More than 6,000 people died all over the Philippines in 2013, with this city being the Ground Zero of inundation. 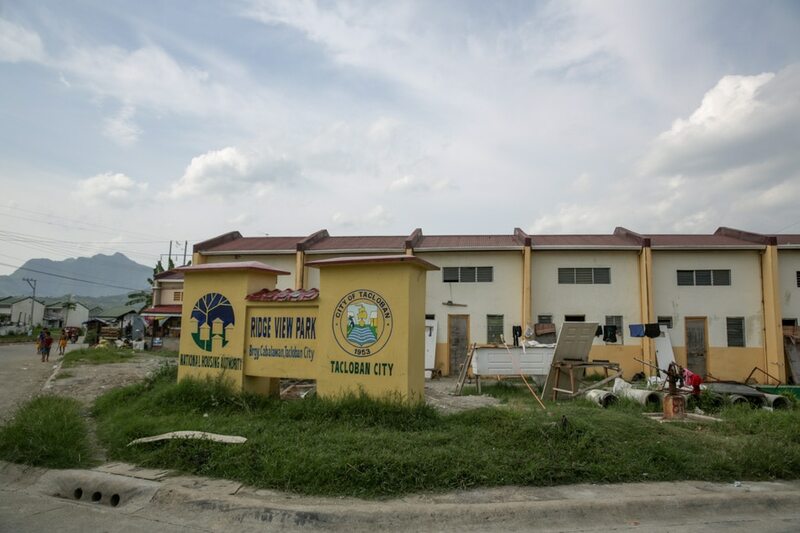 Tacloban has made some strides in rebuilding itself from the rubbles of that typhoon, but even its own local executives say much still needs to be done. At least, the city has been made aware of the critical need to follow the advice of scientists like Lagmay on the proper use of geohazard maps, and now claims incorporating probabilistic maps into their disaster preparations. 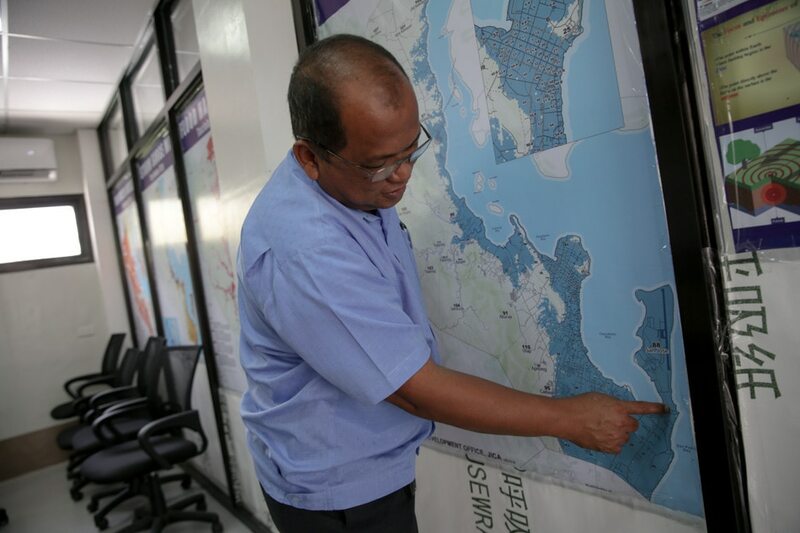 Local disaster risk reduction chief Ildebrando Bernadas, who served as assistant city administrator during the Yolanda disaster, has initiated the preparation of multiple maps for his city. These maps lay down hazard scenarios for Tacloban, and what particular barangays would be affected. There are maps for tsunami, flood, storm surges, rain-induced landslides, and even ground-shaking. Bernadas said these maps incorporate, among others, the probabilistic maps produced by the University of the Philippines-based Nationwide Operational Assessment of Hazards or NOAH group, which Lagmay leads. But they found some mistakes in the labeling of barangays in these NOAH maps, Bernadas said. The Mines and Geosciences Bureau provided them hazard maps, and even oriented them how to appreciate and use these maps. Tacloban City used all these maps as their guide, along with inputs from urban planners and geologists from other countries who went here after Yolanda, Bernadas said. Tacloban has been on the way of several big typhoons after Yolanda, but the people have been quickly evacuated, owing mainly to citizens' initiative to be moved away from identified disaster sites as soon as possible, Bernadas said. The claim that Tacloban has been able to spare itself and its people from typhoons that passed through it is supported by Lagmay's own enumeration of disaster prevention and management wins and fails: Tacloban is nowhere in Lagmay's list of areas devastated by major typhoons. The new challenge the city is facing in securing its citizens from weather-related hazards, however, has to do with long-term urban planning: the absence or dearth of waterways has given way to flooding in some residential areas, and communities still lining the seawalls five years after they have been washed out by Yolanda because the permanent homes where they should move to either lack electricity or power, or are inaccessible to their places of livelihood, or to schools for their children. 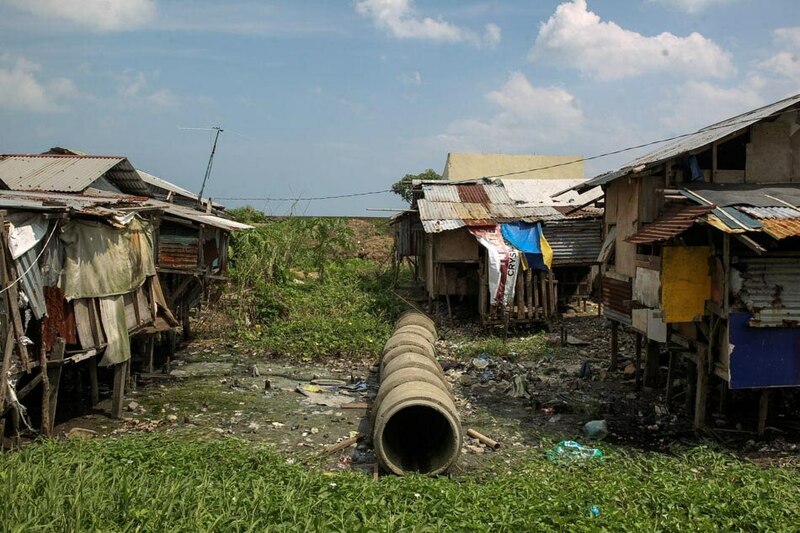 Tacloban Vice Mayor Jerry Yaokasin admitted it is taking them time to clear the coastlines and relocate the communities who have erected back their homes along areas initially identified as “no-build zones” after Yolanda. "As much as we tried... The housing was a little bit slow so even if you know these are in a danger zone, you cannot help but to allow these families to still stay there until the housing sa resettlement site will be addressed," Yaokasin said. 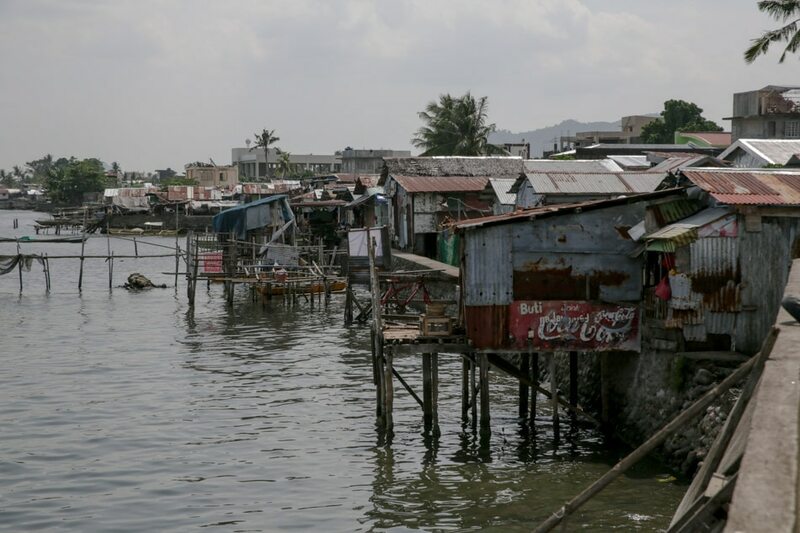 No less than President Rodrigo Duterte in January 2017 ordered the relocation of the people along the seawall danger zones. But realities on the ground appear to be trumping Duterte's or even the local government's political will. Communities abound in these areas despite Duterte's order. Duterte, after inspecting the New Hope Village in Barangay Sta. 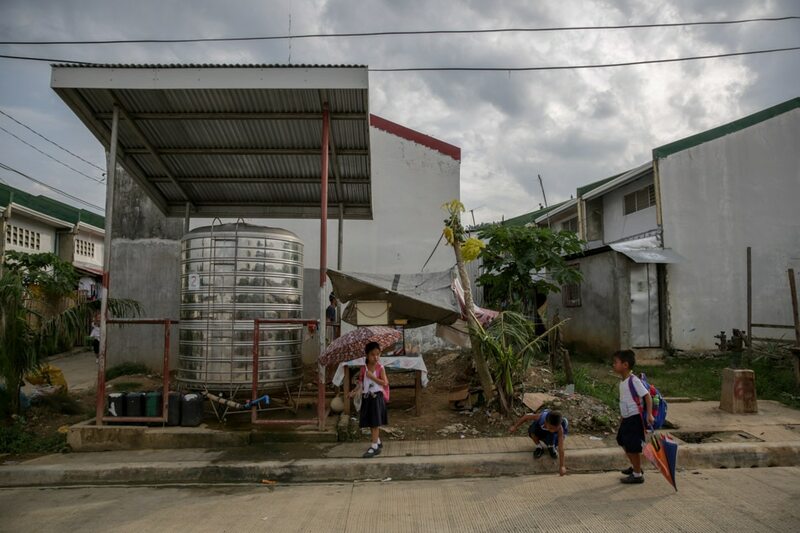 Elena in Tacloban City, Leyte, then ordered government officials to provide water and other facilities to a housing project for residents affected by Yolanda within 15 days. It is not that nobody would like to follow Duterte. But moving thousands of people away from the seawalls is easier said than done. "But then you have to look at the reality also that as much as we want to transfer them to a safer place, but hindi pa tapos eh. So they're still back there in what we call the danger zone,” Yaokasin said. People have refused to relocate despite the offer of free houses because of the absence of piped-in water, electricity, mass transportation, access to markets, and distance from their places of livelihood or their children’s schools. These are issues urban planning would normally address first in building new townships, such as when new town centers are built in Singapore and other developed countries. Bernadas of the Tacloban disaster risk reduction office said the local government was “determined to really demolish” residences lining the city coastline. But the residents were not ready to transfer. “With that reality, the Presidential Management Staff… as per pronouncement, decided to implement a no-demolition order, “ Bernadas said. Tacloban City also earlier bucked the no-build-zone rule, or the ban against the construction of any structure 40 meters within the coastline. The city and the former administration’s Yolanda disaster adviser, Sen. Panfilo Lacson, believe such a prohibition “will not address exceptional circumstances and may be impractical for certain areas” owing to existence of fishing industries or tourism-oriented businesses there. Besides, the Yolanda-inundated areas reached up to a kilometer away from the coastline, Bernadas said. Instead, Tacloban classified its near-coast areas into three: buildable zones, danger zones, and safe zones. “The danger zone is within the coastal area. Beyond this danger zone is the buildable zone, and beyond the buildable zone is the safe zone. Buildable zone in other words, you can construct a structure but not a residential for that matter, so that when a forecast is hoisted, that it would really impact the safety, at least you can leave your structure [and] as such, you can immediately evacuate. 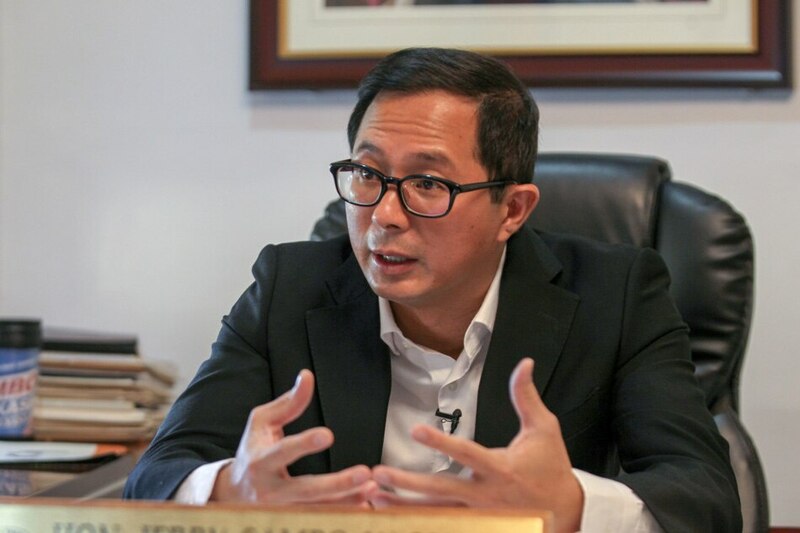 Unlike if you really make it as a residence area, or residential house, the tendency is for people to go back at times simply to secure their belongings or their properties,” Bernadas said. WHY WON’T THEY TAKE THE FREE HOUSE? Forty-two coastal area barangays have agreed to leave should there be a firm order from the city government for them to do so. Thirty-three of these directly face the eastern seaboard, which means they “would be impacted from hazard coming from the sea,” Bernadas said. One of these is Barangay 31, or the Pampango district, home to 3,000 people, about 500 of whom are registered voters. 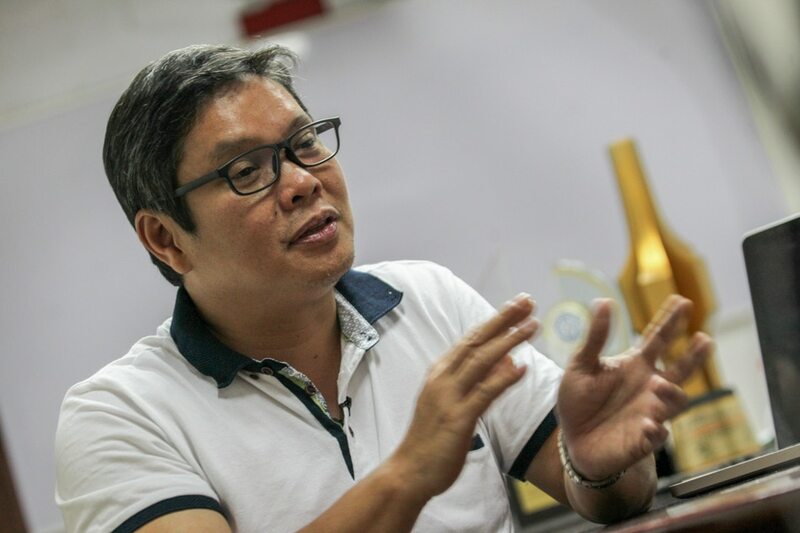 Kagawad Manuel Cabada echoed Bernadas’ line on the Tacloban city-barangay pact: residents would leave the coastal area if there is an instruction from the local government to do so. Residents will leave once there is instruction, Barangay 31 village officer Manuel Cadaba says. Right now, 25 percent of their residents have evacuated to either of two permanent relocation sites: Ridge View in Barangay Cabalawan, or St. Francis in Barangay Suhi. The rest maintain “dual” residences – either they have someone stay in the relocation sites while still living in the coastal area, or they shuttle back and forth between the new and old homes. One of those who refuses to leave is Nelida Sulla, a 56-year-old widow with two adult children and a 14-year-old daughter in Grade 9. 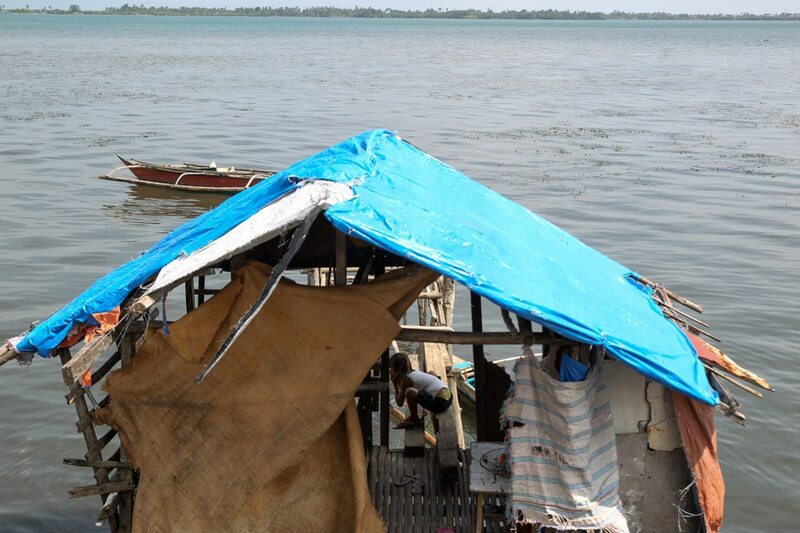 One of Sulla’s sons stays with her in her house, which is about 10 steps away from the seawall. The other son lives in a makeshift house beside hers. Her daughter stays in her house in Ridge View because she studies in a school nearer to Barangay Cabalawan than to Barangay 31. 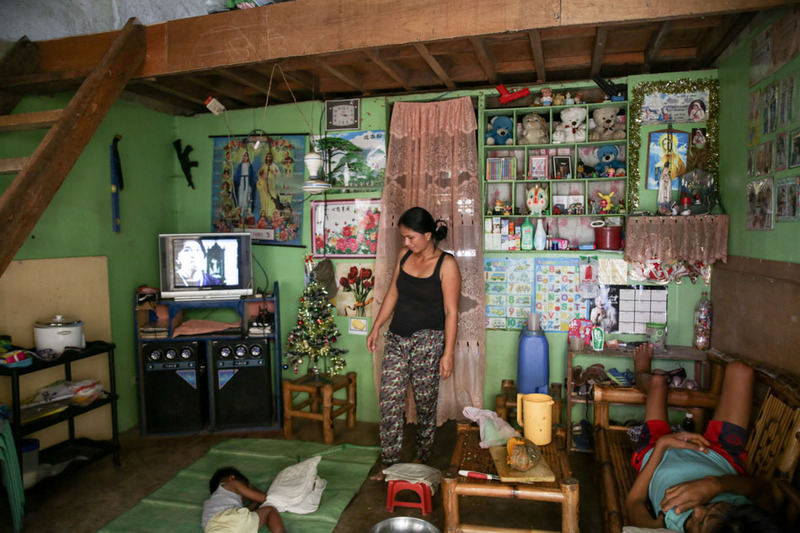 Sulla rebuilt her house in the exact same location where it stood before it was wiped out by Yolanda. Between 7 and 8 a.m., she would sell rags to multicab or jeepney drivers plying the roads near Pampango district. In the evening, she would visit her daughter or stay with her there on some nights. But Sulla is a woman who can’t be moved. “Binabaha ‘pag umuulan. Natulo ang bubong. 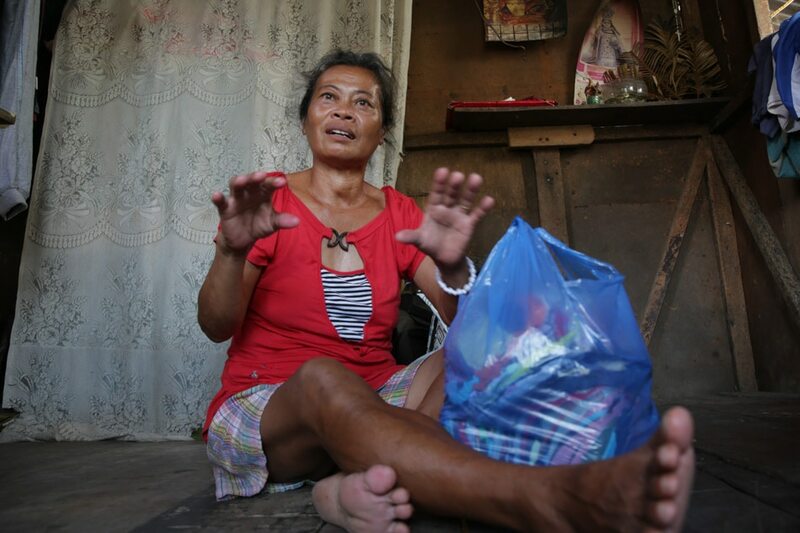 Maski ano’ng reklamo, hindi naman naaayos,” she said when asked why she would not leave her old house.